I use Fedora 28 with XFCE as a virtual machine in Virtualbox 5.2.12, hosted on Windows 10. In full screen mode this works really well. But suddenly I had huge problems with my left mouse button. In some windows it worked, in others it didn’t and vice versa. After trying random things, it worked for some time, then stopped again. Or didn’t work at all. The system was actually unusable any more. As soon as it was clear I just had to use the old 4.16 kernel the next steps where easy. I have been using Let’s Encrypt SSL/TLS certificates since they where available in open beta. Because back then there wasn’t any packaged client to obtain your certs I went with the letsencrypt and later certbot Github vanilla install. That worked very well but is was a little bit cumbersome. The benefit was primarily to be up to date with the latest version and features. Over time, your local clone of certbot clutters with stale branches. That’s not really a problem. But if you want it tidy you might run an occasional git remote prune origin after your pull. Today certbot is available in all major Linux distributions. But if you want the latest and greatest it might be necessary to pick a specific repository. This cronjob reliably renews any due certificates. Awesome. My windows manager of choice for Linux is XFCE. While working in XFCE I realized that I got so accustomed to the Windows 10 keyboard shortcuts for tiling windows, I wanted to have the same functionality in XFCE. And it is no problem to make that happen. 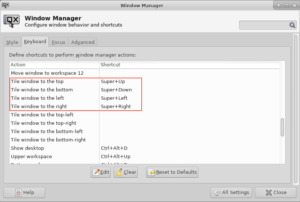 Just go to Settings -> Windows Manager -> select the Keyboard tab. Then scroll down to “Tile windows to the …”, mark the entry you want to change and click the “Edit” button. Follow the instructions. To define a name for use in directives during Apache startup is an easy way to control the behavior of the webserver depending on your environment specifics. This way you can have different configurations applied according to the context, facts you have or variables you set. It is possible to distinguish between production and development, detected facts, the hostname or a context string. And you can have your apache config stored in a git repository which is used on two or more webservers to propagate changes easily between hosts. Here I want to focus on a few keystrokes which help to adjust where your current line appears on your screen in Normal mode. You can display the screen at center even while you are in Insert mode. No need to leave Insert mode, center the screen and reenter Insert mode. That’s especially helpful if you just want to see more context above and beneath your current position. Even though I have been using vim for years now, I realized I should renew and improve what I know about vim in general, especially plugins and stuff. And then there’s a pethora of keyboard shortcuts which can make one’s life a lot easier and more productive. What is “Kali Linux Light”? Do you know the difference between “Kali Linux 32 bit” and “Kali Linux 32 bit Light”? There are several ISO images to choose from when it comes to downloading Kali Linux. Most of them are quite obviously named: “Kali Linux 64 bit XFCE” – no doubt about that. But theres is no hint or easy way to find documentation about the ingredients of this considerably smaller installation variant “light”. This is about how to mirror git repositories from Bitbucket Server to gitolite (read only). This setup can be tremendously helpful if your Bitbucket Server is not reachable from a node where you want to deploy code via git. Or you need some sort of redundancy. dsh (aka Dancers Shell or Distributed Shell) is a very handy tool to improve your ssh automation if you have to manage more than a couple of hosts. You should know that dsh will only be fun if you are using ssh with pulic-key authentication. Otherwise you’ll find yourself typing passwords all day. It has happend: a new engine and a new look for Tobanet.de. After more than 10 years with Dokuwiki, I thought it was high time to move forward and try something new. I used my Wiki to document on the go, write down snippets and some medium sized Howtos (or articles). But a large part of the contents is outdated now and I haven’t been happy with the template for quite some time. Furthermore, I was thinking more and more about this blogging thing. Dokuwiki is a great peace of software – but there is one major problem that has been bothering me for a long time: there isn’t a single modern, responsive template I like. I used the Arctic Template from the beginning. It was a pretty cool template back then, with a modern look and all the functionality I needed.